Like several other months during the 2012 year, November brought about a gain for the Ford brand while the luxury Lincoln brand struggled – posting another month of negative growth. Things went pretty well for Ford Motor Company in November 2012 in terms of both sales volume and sales growth but once again, their premium Lincoln brand struggled with a dealership lineup that has clearly grown stale in the eyes of consumers. FoMoCo has been promising an increased effort for the Lincoln brand including more marketing and new models but 2012 has been tough for the luxury brand as competitors like Cadillac have been active in pushing out new models while Lincoln has not. The Ford brand was the company’s best in terms of both sales volume with 171,941 vehicles sold and sales growth with a jump of 7.1% - making Ford the bestselling single brand in the US auto industry – beating Toyota by some 31,000 units. The compact Ford Focus sedan and hatchback combined to be the top model from Ford in terms of growth with an increase of 56% while the mighty Mustang was second with 37.4% growth and the F Series pickup was third with a jump of 17.9%. (The Ford Heavy Truck lineup was technically third with a gain of 37% but for the sake of discussion, we will stick to those regular consumer models.) In terms of sales volume, the Ford F Series was the top dog with 56,299 trucks sold followed by the new Escape with 20,970 compact SUVS sold and the Focus was third with 18,312 units sold. More importantly, the new Ford C-Max hybrid lineup had an incredible November with 4,848 units sold last month – helping Ford to be the top hybrid seller in the US market. 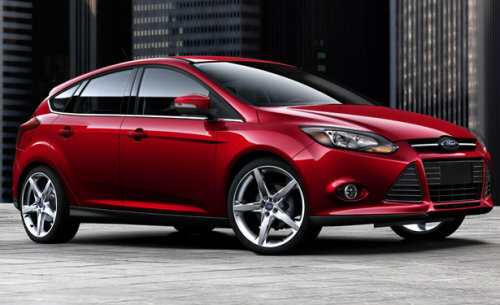 On the year, the Ford brand is up 5.4% with 1,961,177 new vehicles sold during the first 11 months of 2012. Things weren’t so bright for the Lincoln brand in November 2012 due to a decline in growth of 9.1%. On top of that, almost every other major luxury brand in the US including Cadillac, Acura, Infiniti, Lexus and even Chrysler sold vastly more vehicles than did Lincoln. Even though Lincoln posted negative year over year growth in November 2012, 4 of the 5 models still in production from Lincoln posted positive growth. Lincoln was led in growth by the MKT with a jump of 65.7% while the MKX was second with a gain of 6.3% while the MKS was third with an increase of 4.7%. The big hit to Lincoln’s bottom line was the slow sales of the popular MKZ as consumers eagerly await the refreshed MKZ based on the 2013 Ford Fusion. In terms of sales volume, the MKX was the top dog with 2,108 units sold followed by the MKZ with 1,335 units in second and the MKS was third in overall sales with 1,065 larger sedans sold. The new marketing campaign hit the internet this month but those new models cannot come soon enough for Lincoln dealerships and sales continue to slump. One of the last lines in your article reads "those new models cannot come soon enough for Lincoln dealerships". As a lifelong Lincoln man I think that the "Lincoln Motor Company" might be too little too late. I love the looks of the MKZ but to go where no one has before, you need to look at where everyone (who is selling cars) is. The competing vehicles from BMW, Mercedes, Audi, Lexus, Infiniti and Cadillac are genuine performance sedans. Their buyers have abandoned the cushy ride for handling and impressive acceleration. How could Lincoln come to the table with front wheel drive?? Not many years ago Cadillac was dead... not even considered by someone looking for a performance vehicle. Cadillac went to the Corvette guys and asked them to build an American BMW. The CTS was born and with this year's introduction of the ATS Cadillac is right in the middle of the fight with some models even beating the Germans on their own track! Their sales are definitely reflecting this. Perhaps the new MKZ is the start of a badly needed turnaround for Lincoln but much work lies ahead. Ford knows how to build performance vehicles... The Mustang and SVT divisions are proof. Let's see them get involved in Lincoln's renascence. Rear wheel drive is a must, Performance engines on several levels are needed including a V8 ( M series, AMG, and V series competitors) How about a modern version of the LS? Sleek looks are a great start but the car critics will kill them if performance doesn't match. There's a lot riding on this!